preferred Water Mitgation Cleanup & Drying specialists for 30 Years. Call 1-888-843-2177 or Request a Property Damage Survey. Our locally established family owned company serves the following areas: Altoona, Bedford, Everett, Hollidaysburg, Huntingdon, Mount Union, Roaring Spring, Saxton/Raystown Lake, Tyrone, as well as localities in Centre County, Cambia County and Fulton County. Act now to prevent further loss ! 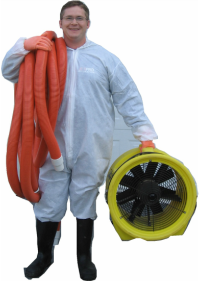 Anyone can extract and remove seen water, however it's the unseen water/moisture that requires specialized training to mitigate further damage or prevent mold. Your Job Supervisor will see to it that every measure is taken to find and correct/dry sources of moisture and employ the techniques and equipment necessary to fully return your home to a verified dry condition. In the meantime, there are some Steps you can take. 2.) Report the water loss to your Insurance Agent. or move to an ajacent area for drying purposes. 2. ) Extract Standing Water if present. 3.) Survey the damage, record water migration and moisture analysis. 4.) Remove materials that could prevent complete drying. We work with you or your staff to provide the solutions you need. "Our staff will complete your project Safely, Efficiently and Completely. If we have not met the goals setout at beginning of project and your not 100% Thrilled, we will correct any deficiencies at our expense."